Camosun College and the BCCA host the launch of BC Construction and Skilled trades month with a breakfast for students, faculty and, partners. Vancouver Island Construction Association is hosting a private contractors breakfast for their members at their Nanaimo office. The flagship event of construction month recognizing leaders within the construction industry for all that they do not only on the job site but also in the community. Chunghwa Investment Canada and Scott Construction Group are proud to host the Ground Breaking Ceremony at the new Bridgeport Business Centre project in Richmond, BC. The commercial development will include four building to be constructed across three phases. At Scott Construction’s SFU Student Residences Phase 1 job site, they will be hosting 14 students and their instructor, Tim Bruderer, from the Camosun College-sponsored Ace-it Construction Electrician pre-employment program at Burnaby Mountain Secondary School. Students attend the program for full days every second day. Upon achieving 70%, they complete Level 1 of their Electrical Apprenticeship. Century Group Inc. Construction is hosting a private contractors breakfast for 50-100 of their workers on their job site in Cordova Bay. Vancouver Regional Construction Association is hosting a private contractors breakfast for their members at their Vancouver office. Kinetic Construction is hosting a private contractors breakfast for 70 of their workers at their office in Victoria BC. Campbell Construction is hosting a private contractors breakfast for 70 of their workers at their office in Victoria BC. NRCA & CNC are hosting a private contractors breakfast on the CNC campus to promote women in the trades. Bringing together industry partners, members, students and, staff. Scott Construction Group is hosting a private contractors breakfast for 50-60 of their workers on their job site at the Link in Colingwood. SICA is hosting a private contractors breakfast on the Okanagan College Kelowna Campus. Bringing together industry partners, members, students and, staff. Vancouver Island Construction Association is hosting a private contractors breakfast for their members at their Victoria office. SICA is hosting a private contractors breakfast on the Thompson Rivers University Kamloops Campus. Bringing together industry partners, members, students and, staff. Are you hosting an event in your community during construction month? 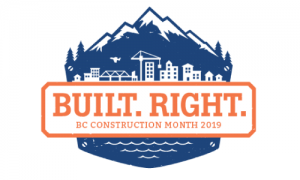 Let us know and we will happily add it to construction month 2019.